I paddled hard for this left hander that was jumping up on the outside sandbar yesterday. Getting in early, I grabbed a rail as it pitched and the bottom dropped out. I made the drop and skirted for the open face. To my left I could make out the body of another surfer. He was paddling for the very wave I was already up and riding. I let out a little "Hey hey!" He looked right at me and I recognized the face. It was the face of a full blown kook. His sheer look of determination had sealed my fate. By God, he was going to catch this wave if it was the last wave on earth. I let out another "Hey!" He paid me no attention. He got to his feet as I turned away from him. He let out a yell as he fell backwards and shot his board in my direction. I heard our boards collide. I looked at him and said. "Man that was my first wave of the Summer." He looked at me and said "Don't worry, the surf should get better before the summer is over." I looked at him and said, "You're missing my point. That was my first wave of the summer and I was hoping to surf it alone. That's why I called you off the wave." He looked confused. Then I added, "And you hit my board." "No I didn't". I turned my board over and sure enough, he had knocked one of my fins off. Shattered it. Like a dam IED in Iraq or something. "I didn't paddle out here with two fins". "I'm sorry." I shook my head as I paddled back out with two fins. My very first Summer wave. How's that? It's July 1st, 2006 and this was my first wave of the 2006 Summer season? Why? I guess I should back up a bit here guys. Three weeks ago, my son came home with three unacceptable grades on his report card. I had warned him all year long that there would be consequences if he had bad grades. Now, my dilemma of being a dad who surfs came into play here. Which I might add, is quite a dilemma. And, I'd like to throw this out to you all. Which do you think is worse, having a dad who surfs or one who does not? Clearly the pros of having a father who surfs are great. Dad takes you surfing. Dad takes your friends surfing. Dad understands what it's like to be a surfer. The cons however, are just as significant. Dad understands what it's like to lose surfing. I took him out of the ocean for 3 weeks. He also lost his Play Station2, his X-box, his computer, his TV viewing, his telephone and I gave him a haircut. But make no mistake about it. It was the Surfing that got to him the most. Not only did he NOT surf but I didn't surf either. Why punish myself? 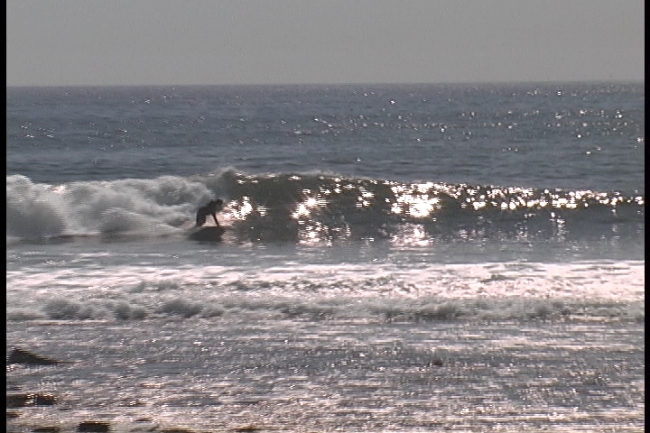 I wanted him to know that I clearly felt his pain, and was willing to sacrifice my own surf time to prove a point. He could not believe it. Bottom line. He learned a valuable lesson. He now knows that Dad means business. My son is in the 90th percentile as far as his Testing goes. He's a smart kid, who just got smarter. Was I to harsh? Maybe in some of your eyes, but I think the lesson was well learned. And it was widespread. My other two kids learned something too. I kept my word. I said there would be NO SURFING if he messed up. There's no denying that I mean what I say. Put it this way, if my father had known how much surfing meant to me when I was in school and he threatened to take it away if I did poorly in school. I would of had straight "A's". I would of been on the Honor Roll. Just like Max will be come next September. Guaranteed. There's a new language that I recently discovered at the Wall this weekend. I call it CANOOK. It's a cross between French Canadian and Kookdom. Now look, before some of my French Canadian brothers and sisters start freaking out and bad mouthing me here, let me point something out to you all. First and foremost. I happen to respect Canadians. They have been Allies of the US since WWI. In WWII alone they lost some 40,000 men fighting along side of us. They are our current allies in the GWOT and recently lost several troops just last week in Afghanistan. I respect the Canadians. But a Kook, is a kook, is a kook. And it does not matter if the Kook comes from New England, California, Hawaii, Australia or Canada. A Kook is a kook. I happen to enjoy the Kook. I mean, I personally find them entertaining. Unless of course they run me over and hurt the ones I love. So this new language that I speak of CANOOK? Where is this story going? Nowhere in particular. I just happened upon this newly discovered language by having the distinct pleasure of riding the same wave with three French Canadian Kooks on three consecutive waves. Let me explain. I caught a wave and was minding my own business doing what we all enjoy. Surfing. When I got to the inside section, I noticed the gaggle of Kooks floundering around on their BICs. They screamed with delight as I got closer. And then proceeded (all three of them) to paddle for the same wave that I was already riding. None of them could Stand up. They just sort of got into this fetal position as they screamed and wailed in their native dialect and hooted at the same time. They did this three times in a row. At first I was mildly amused. Then I became concerned and somewhat agitated. Finally, I resolved to thinking that I had no control over them and that if I tried to explain to them, that what they were doing was wrong, I would only become more frustrated. So, I just smiled and paddled away. It was the July 4th weekend and they were out in force. Last Sunday night I got to meet the legendary Surf Movie maker Jack McCoy. It was an honor to meet him. The IOKA Movie theater in Exeter, NH was the venue for his latest movie "FREE AS A DOG" . 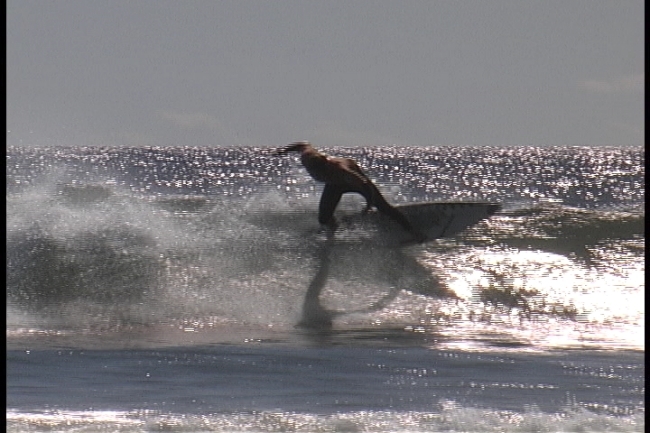 It was another successful full length feature film on Surfing that was played before a packed house. Jack McCoy is one of the best. And his BILLABONG Movie Tour is so freaking cool! I was stoked to be part of this experience. I think anyone who was there will agree. There's nothing like being in a movie theater with a bunch of surfers watching a Surf Flick. I'm not going to compare what I do, to what he does, but there are similarities. Anyone who's ever worked on a surf movie knows what I'm talking about. We know every single wave in the movie. Every ride, Every single scene and every single song. We know each and every transition and special affect. In short we spend hours and hours shooting, editing and scoring each movie. It's a true labor of love and the payoff is watching and hearing you guys hoot and holler at the finished piece. Actually, the New England audiences have been for the most part, quite reserved. Clearly stoked to be there and taking it all in, but more quiet than other audiences. But that's cool. I was happy to see 90% of the audience actually sit through all the credits at the end of the movie. Plus they really let out a thunderous applause at the end. Jack McCoy was stoked. And I felt good for him knowing that you all appreciated what he had created. And the short film before the main flick was hilarious. It was a short flick by Tony Mason an Aussie (Kook), who totally goofed on himself and surfing. We all laughed so hard. It was genius. Speaking of Summer Surf Movies, SUMMER 05 is out. Click here to see the promo poster. WOW! the Sox won 12 in a row! Why couldn't it be 13? Happy June 30th Birthdays to Dave "Crop" Cropper, Cory, Kyle and Mike Tyson. I can't remember this guy's name. I know the guy. I've surfed with him about 25 years ago. Blond hair. Moustache. I just can't remember his name. If Jack Keefe were here tonight he'd tell me. But he's away for the long weekend. surfers figures out who this is, please drop me an email so I can give him his props. I hope he still surfs. surfers and a few pros thrown in for some added stoke. 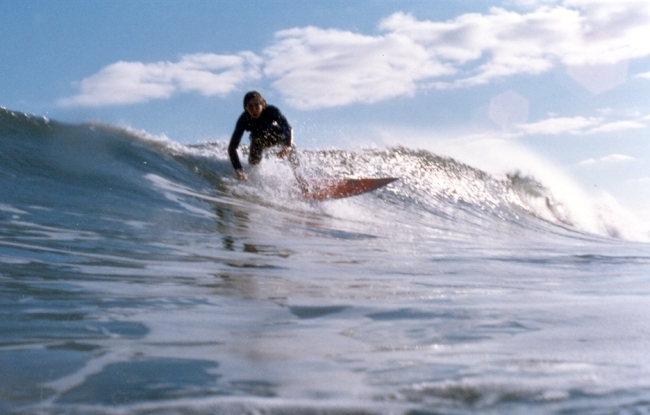 Local Hampton Surfer Rick Evans on his first wave in four years. One of the true highlights of the movie. I'm not going to lie and say I was not excited to pose with Jack McCoy. It was an honor to meet him and "Talk Shop".